I believe everyone has a guardian angel, and for some magical reason whoever plays this game their angel send them messages. There seems to be a theme when you play. Each player attracts to them where to land on the board. When you roll the dice, your energy goes into your roll and the stone you land on is not by fluke chance. The card(s) you pick out of the deck is also not by fluke. Your angels are giving you a message so that you can learn an important piece of needed information about your self-growth and personal empowerment. Each time you play you will receive your message(s) from your angels. The great thing about this game is... you can play with just yourself OR invite up to six others to play with you. This game has some magic in it! Really. That The Messages Are So Incredible! I am Ready To Awaken My Body, Mind and Soul… I am Ready To Hear Your Messages! I Am Ready To Create My Dreams Into Reality! 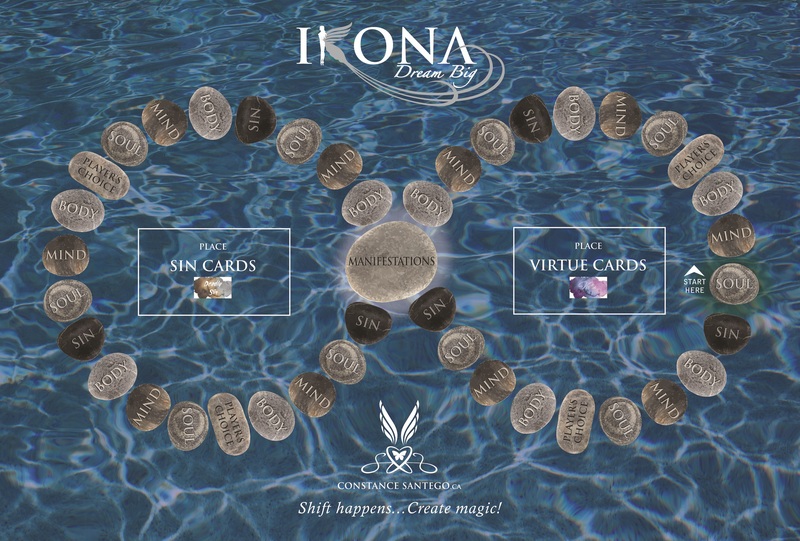 Constance’s meaning for Ikona is dreams. The magic is in changing your perception and creating a new reality. Dream Big, REALLY BIG! So big that your friends and family say “there they go again”. Einstein, Bell, Edison, Wright Brothers, Cooper, Winfrey, Trump, Gates, Depp, Lopez, Aniston, Roberts, Lady Gaga, Robbins, Kiyosaki, Hay, Virtue, Chopra, Browne and sooo many others all dreamed big. Let your imagination go and create some magic in your life! 3) Change; turn your subconscious negatives thoughts into positive ones. Create a new path! …These Are The Keys To Your Future. “God’s gift to us is more talent and ability than we’ll ever hope to use in our lifetime. Empowering Yourself one game at a time! Is receiving endless messages from your angels about your body, mind & soul worth $180? The magic to this type of communication; is not only that it is fun, but it will show you what you need to work on in your life. Before you invite your fellow enlightened gamers over, we suggest that you read over these “Rules of the Game”. Goal of the Game: Collect all seven Virtue cards! Place all card decks on or near the board (Virtue and Sin cards have a place). Have each player pick one colored crystal for his/her playing piece (see meanings in appendix). Place all crystals in the bag, first player picks first (No peeking) and then in order. Every player starts with one Virtue card to the corresponding crystal they chose. Place your crystal on the marked “start here” soul stone. The starting player rolls the die and moves spaces according to the number shown following the arrows around the board (Landing on the same space as another player has no effect on either player). Body, Mind, or Soul Stone, draw a corresponding card and read it out loud (Please refer to the card instructions). Helping you Develop your awareness! Feather – Some cards use a feather. Goals – Say or write three goals to collect victory star(s), (To write out what is asked will not be achievable during this game, but do this as homework…all of you!). Chose the correct answer to collect victory star(s). Some cards have one or more questions, answer all the questions. Collect one victory star per correct answer. If you successfully complete the instructions on the card, collect the amount of victory stars shown on the bottom of the card. If you fail to successfully complete the instructions or choose to pass, collect zero victory stars. Sin Stone, when you land on a Sin stone, Shuffle and draw a card from the Deathly Sin cards, Players in possession of the corresponding Virtue card are immune to the effects stated on the card. If you do not have the corresponding virtue card, you lose 2 victory stars. You cannot go below zero stars. Players Choice Stone, you can choose from one of the three card decks: Body, Mind, or Soul -follow instructions as in I.
Manifestation Stone, when you land on or about to pass the manifestation stone, Stop Right There! This is where you purchase virtue cards. (Remember to collect seven different virtue cards to win). 2 stars buys you one virtue card, you can purchase as many as you can afford. The game ends when a player stops on the manifestation stone and can buy their seventh virtue…Remember, the more you play…the more you learn, the more you retain, AND THE MORE YOUR SUBCONSCIOUS IS REBOOTED (REPROGRAMED). Special Note: It is interesting to notice what cards you are drawing, sometimes there is a pattern to a player. That pattern could show hidden paradigms that you never noticed before. Taking notice of your paradigms is one of the keys to your future. Success and money; has been called the “merchants stone” because it was said that if you (a merchant) place a piece of citrine in your cash box it will produce more income for you (the merchant). Happy, Tranquility, clarity of mind and creative self-expression; also said to assure love, affection, youth, and health to the wearer of this stone. Overall good being, very good for expressing, balancing and soothing all emotions. Tranquility, calming, particularly good at dissolving anger and frustration; it helps to quiet the mind, dissolving emotional or spiritual confusion. Inspiration, intuition and ability to soothe nerves in times of stress, make the wearer become calm and gentle, repress evil and make men successful in business. Endurance, Stress-free, protection, to promote learning and it was believed to be able to make a person feel personal pride and to create an overall joy in living. Excellent meditation and decision making stone, grounding, believed to defeat sorcery in all its forms and inspire courage. This Game has another way to play…awesome for manifesting change! Body Mind and Soul Cards can also be used as Manifestation Oracle cards. Conictionary (Constance’s meaning of Oracle): Choice; card pick of the day. You can have intent before you pick or just let your subconscious pick for you. Read your card for that day and follow the instructions. Some people like to stay on one card for twenty one days to create change in a habit. Or do at least 7 times to understand a new idea. Seeing, doing or writing, speaking and repeating over and over again creates new understanding and subconscious action. Embrace that chance to release the energy that is holding you back from becoming that person you desire to be! Breathe in and release! You can play alone or with friends; if with friends will take a few days to complete. Some choose to play once per week until finished. Write out one hundred different things / goals to accomplish before death, not just ten or fifty…100. It does not matter if you believe you can or cannot accomplish them, just write them down. I have been told, many times, that if you put pen in hand and write your thoughts on paper your brain chemistry changes and starts to create your reality. Have you ever owned or driven a vehicle and all you see is that vehicle; make, model and/or color around town, and then you buy a different vehicle and now all you see is the new one all over town and have forgotten about the other one you had just owned. Your brain is amazing. It is like the law of attraction, what you think you will attract. Anything you can think of, write it down…this may take a couple of days to weeks to complete your list…time is not the issue; and later … you can add to your list as you complete items. After you have completed writing down your hundred goals…the odds are that you will accomplish more than eighty percent of them. Most of my students and clients notice a change almost instantly. For the game…You have a generic goal card. This is just to place around the house or car or work to remind yourself of your goal(s). Big ticket item – Example car, truck, RV, engagement ring, furniture, etc. Education – What: certificate, diploma, masters, Doctors, etc. Vacation – Where do you want to travel next? On each individual card choose one of your goals from your original 100 you wrote down earlier. Pick one for all the categories, if you did not think of one, do so now. On the back of each card write the main goal for each category that you are going to manifest. Weirdly enough some of your other goals may happen before the one you are working on…Woot, Woot! Detailed goal – write out in detail and future tense as if you already have the goal in present tense (can be a few pages if necessary). The mind works on memories! What is your habit – If you can figure out a negative habit you are doing and change it, you will be able to manifest. The old saying “If you keep doing what you have always done, you will keep getting what you always have”. Or, I like the story Bob Proctor tells of the little fly continually trying to get outside trough the closed window until its death...even though there is an open door inches away. Moral of this story is to try another approach, change your paradigm / pattern / habit. Ways to change your habit: New Knowledge, Counselling, Hypnosis, Meditation, Repetition…Practice, Practice, Practice! Action plan – What is your next step? Brain storm. There is always a better way. 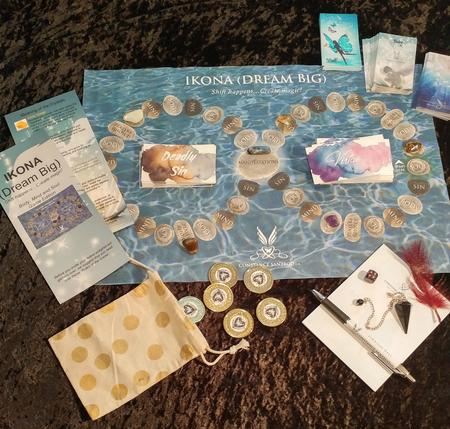 Now you are ready to play the Ikona Dream Big Game. Choose one of your goals to work on while you are playing the game. When you land on a Body, Mind or Soul stone do what it asks, but also think about how it relates to your goal. After your turn write in your journal how it relates to your goal. When you land on a sin stone and pick a card, read it out loud, reflect on which one of the seven sin cards you chose…write in your journal anything that the card represents to you. If you seem to be choosing the same sin card during the game you will need to meditate later (after the game when you are alone) and release that negative energy. Come up with your own meditation or on my Youtube channel (Constance Santego) listen to the negative energy release meditation. When you pass manifestation (read Achieving your Dreams - How to make your dreams/ wishes/ desires come true.) and can buy virtue cards with your stars; each virtue is a positive in your life something to strive for. The virtue card that came from the crystal you chose at the beginning of the game will tell you something about yourself and the goal you are working on. Write in your journal how each virtue reflects in your life and your goal & how this virtue can improve your life even more. A person needs to be balanced in all four aspects of themselves: Physical, Mental, Spiritual and Emotional. What needs to be balanced or worked on today? 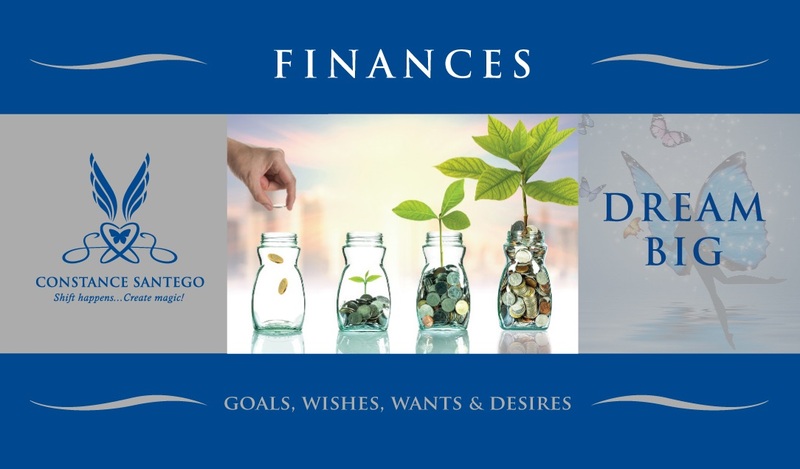 Every time you play the game you can get deeper and deeper into your personal growth; Health, Wealth and Happiness is our goal in helping you achieve your Dreams, Wishes and Desires. Continue writing in your Journal…Write every day all the successes you had, even the little tiny ones. It is amazing to look back at in a few months or years from now and read what you had acomplished.